Elevation of a depressed nose by adding cartilage, bone silicone implant. Reduction of the bulk of the tip. Narrowing of the base of the nose, etc. The incisions for reducing or recontouring the external nose are usually made inside the nose or in the collumella. So there are hardly any visible marks on the nose after a Rhinoplasty. 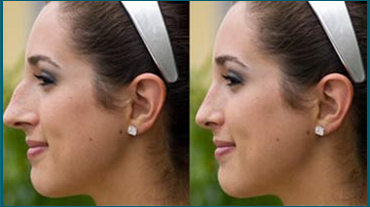 It takes about 1 to 3 hours for Rhinoplasty depending upon what has to be done. Most case of Rhinoplasty can be done as an out patient procedure without any hospital stay, you leaving the hospital on the day of the operation. Anaesthesia - you will be given a general or local anaesthetic. Post trauma - to repair a broken nose, slender instruments are usually inserted into each nostril to gently push the bones back into their proper alignment. A bad break may require a small cut (incision), so that the surgeon can see to arrange the bone fragments correctly. Cosmetic surgery - rhinoplasty for cosmetic reasons can include 'open' or 'closed' techniques. 'Open' technique - this involves accessing the nasal bones via incisions inside the nostrils and through the columella (the skin that separates the nostrils). 'Closed' technique - this involves accessing the nasal bones via incisions inside the nostrils. Once the incisions are made, the skin is lifted away from the underlying bones and cartilages. Surgical procedures - this depends on the reshaping required; for example, the nasal bones may be chiselled, or broken and realigned, or else cartilage may be trimmed back. Stitches - incisions are closed with dissolving stitches.